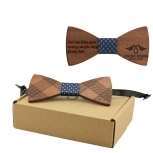 Visit our shop for more unique models from our new arrival of Engraved wooden watches and bow ties. 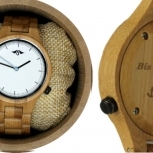 Each quality wooden watch will be custom laser engraved to your specific needs. 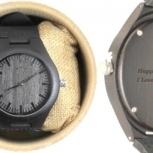 Please send us your text requirements including any black and white images, handwriting samples, or anything else that will fit on the back of a wooden watch. Standard text is free and can be requested at the time of order. The text will be displayed as Georgia Italic font unless specified. The exact font size will depend on the amount of text as we will need to adjust it to best utilize the space. Note that any personalization requests over and above the standard text will incur an additional charge. Please contact us for exact pricing relating to customized extras before the placement of your order. 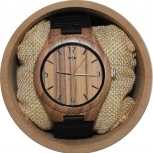 This Maple Men's Watch by Angie Wood Creations offers an unassuming charm thanks to the contrasting wood grains. Paired with a maple and red sandalwood bracelet as well as a red sandalwood bezel and dial, this delightful men's watch will empower your wardrobe and enhance your sense of style. The mix of the dark and light wood tones will immediately draw your eye allowing you to take in the stunning silver finish that automatically elevates the dial. With classic Roman numerals teemed with simple bar markers and a trio of subdials, the attention to detail stands out in the mix on this classic analog wristwatch for men. CONTRASTING COLORS: The pale tones of the maple ensure that that beauty and the richness of the red sandalwood stand out with ease. 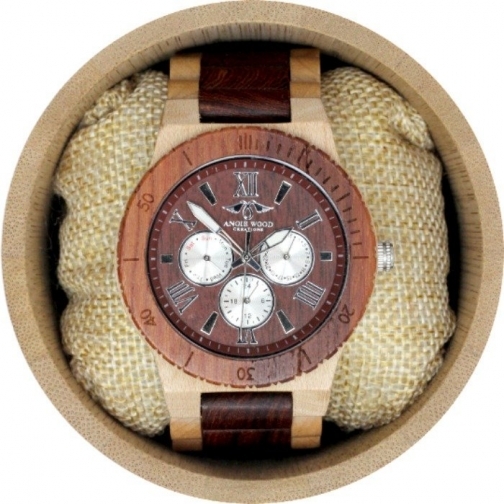 It is the mix of the two wood tones on this analog men's timepiece that give it a masculine and extravagant feel. Why blend in with the rest when you have the chance to stand out? 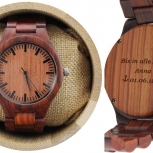 ETCHED WOOD: Often it is the smallest detail on a wooden watch that can give it the biggest impact. Upon closer inspection, you will notice that the bezel is cleverly etched with markers and numerals to maintain its originality and innovativeness. This attention to detail by the skilled artisans puts this watch in a class of its own. SILVER DETAILING: The silver-enhanced dial on this maple and red sandalwood watch from Angie Wood Creations is pure brilliance. It allows for ease of time telling and puts the focus directly on the dial with its three subdials and streamlined watch hands. Never miss an appointment or meeting again when you are wearing this little number on your wrist. 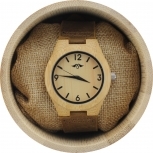 ECO-FRIENDLY FASHION CHOICE: The wooden watch redefines the traditional watch giving an alternative to those looking for a more eco-friendly fashion accessory. Whether you are seeking a quality gift for your wedding party, wife, sister or daughter, a watch by Angie Wood Creations will be appreciated. Note that we use a manufacturer for our production, we design the watch along with them and produce it. We then customize the watch to your liking ourselves, in our shop and ship it directly to you from our shop in Deux-Montagnes Quebec,Canada. Item ships from: Deux-Montagnes, QC, Canada. $8.00 CAD ($5.00 CAD when combined with another item) by CANADA POST. Expedited Rate: $25.00 CAD ($15.00 CAD when combined with another item) by UPS/DHL. $8.00 CAD ($5.00 CAD when combined with another item) by CANADA POST. Expedited Rate: $25.00 CAD ($10.00 CAD when combined with another item) by UPS/DHL. $8.00 CAD ($5.00 CAD when combined with another item) by CANADA POST No tracking number 5-21 business days. Expedited Rate: $35.00 CAD ($15.00 CAD when combined with another item) by UPS/DHL 3-7 business days.